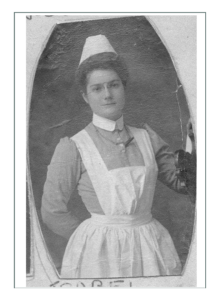 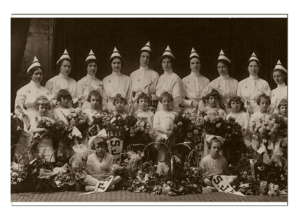 Ellie’s character is a U.S. born citizen, educated through early schools and later nursing school in the midwestern or eastern states; most likely the Philadelphia, Pennsylvania or Chicago, Illinois areas where medical institutions had strong nursing programs by 1910. 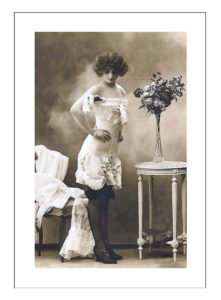 She would most likely be a single woman and living on her own. 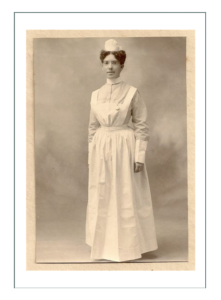 Of limited means; perhaps a stipend from home plus her nursing wages, she would most likely live within walking distance of her place of work. 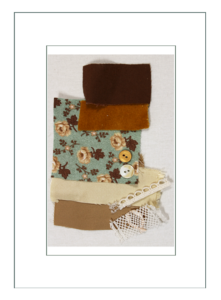 This would mean a city apartment. 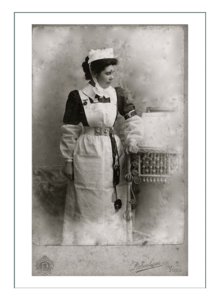 Her loyalty would be to the institution in which she trained, and most likely she would be hired by the same organization. 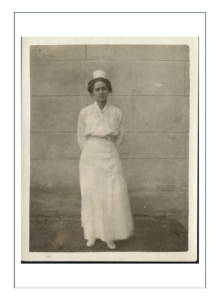 She would work her way up the ranks, so that by the entrance of the US in World War I in about 1915, she would be a senior or administrative nurse, having been educated at the highest level possible at the time, and coming from a family of some means. 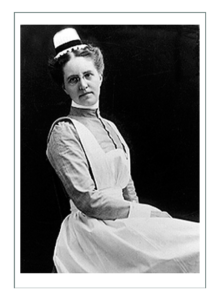 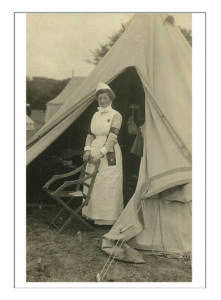 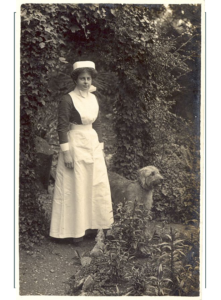 She would have volunteered to go on a steamship to France with the American Nurses (because her PA institution would have ties to it) rather than the Red Cross, as a professionally and specifically trained “war nurse”. 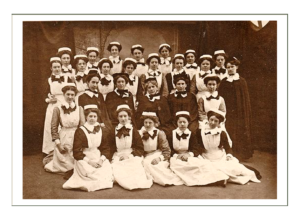 There she might have met the Military Medical Corps nurses of Queen Alexandra. 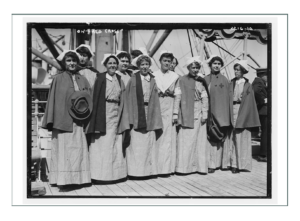 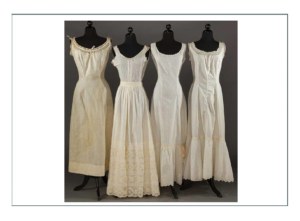 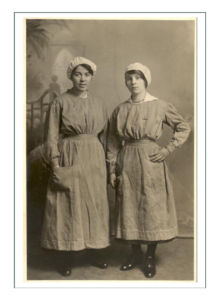 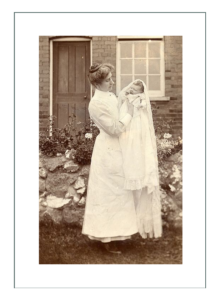 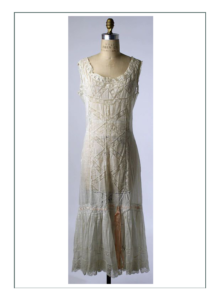 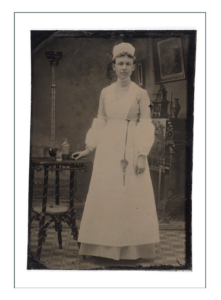 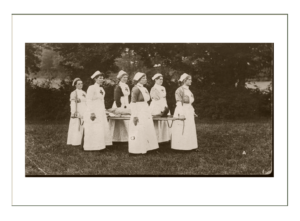 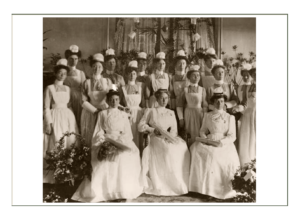 Design for Ellie’s ensemble comes from the anecdotal and historical evidence of real nurses of the time, and predominiantly from photos of nurses of similar institutions at home and abroad. 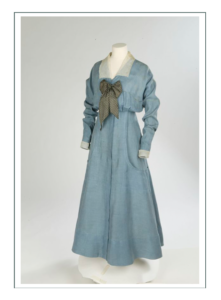 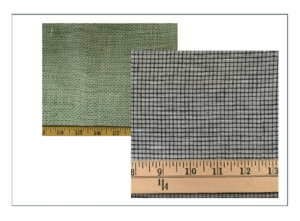 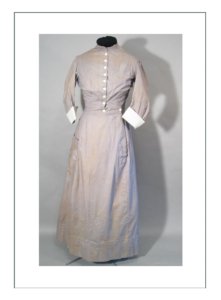 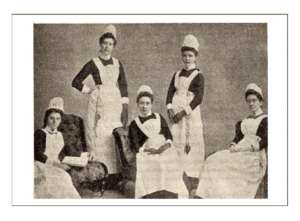 Since there are virtually no patterns or guides for uniforming for nurses or for domestic servants or even nuns on which the history of nursing costumes is based, we must use “high fashion” patterns of the day, and modify them to what a working woman, and specifically a nurse would wear. 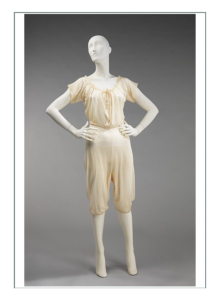 We will not be doing extensive sketches with alternatives for Ellie as we have other ensembles, because 1) there is little information to actually tie the character down; 2) we can do whatever we want given the basic silhouette, technology (accessories, fabrics, notions, etc.). 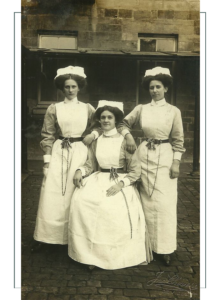 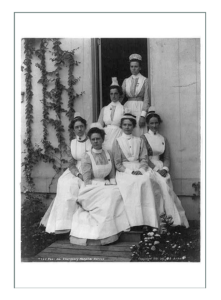 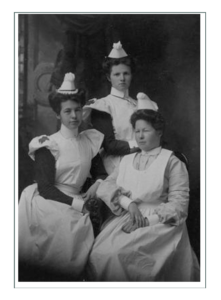 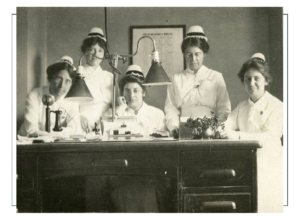 Following are decisions based on historical research and real nurse examples; design in words rather than pictures. 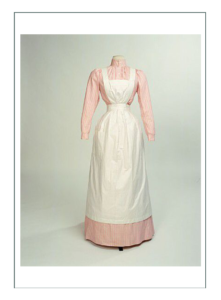 Ellie’s apron is based on examples of typical American hospital aprons; a simple, stiff premium cotton with a “strapped” bib, full over the shoulder wide straps so they don’t slip, and just enough gathers to protect the skirt most of the way around. 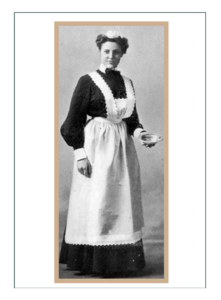 What is different that that of housewives and past aprons, is that it is the same length as the skirt to protect it all the way to a dirty floor or the ground. 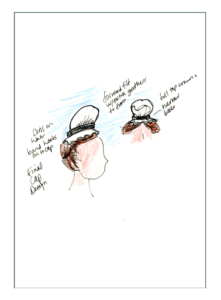 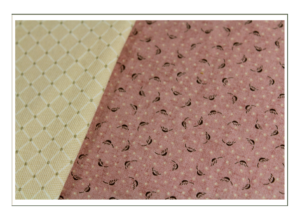 As there is little information and no patterns or instructions for caps, Ellie’s is based solely on photos, and starts with the design of a white cotton mobcap of 1790. 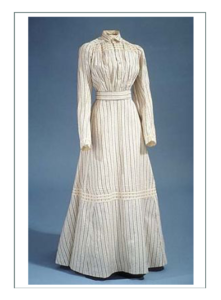 We made it much smaller with just enough covering to hold the hair off the face, and added the “black stripe” which indicates her senior administrative status. 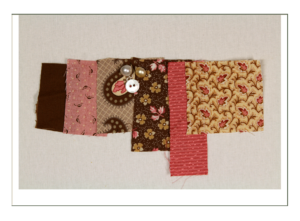 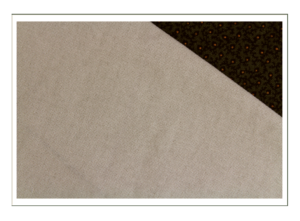 Ellie’s belt is of a 1″ wide woven elastic with a simple looped clasp. 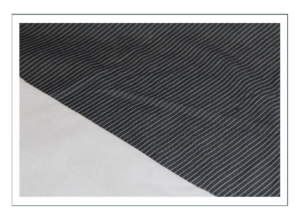 This allows for change in waist size, and gives enough strength to hold the AUTHENTIC hand cast metal belt hook with it’s heart cut out. 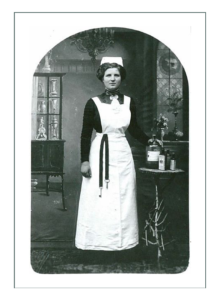 Ellie’s being a supervisory nurse carries tools for advanced wound dressing including scissors and forceps as well as an AUTHENTIC 1910 syringe plunger. 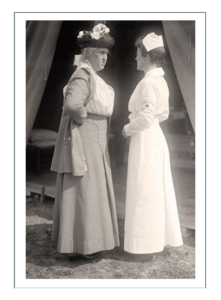 She would have blood pressure and thermometers. 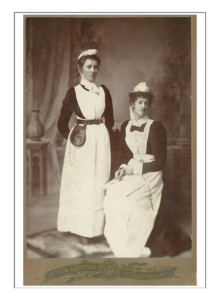 Her accessories are minimal and specific to WORKing: durable and comfortable low heeled (yet fashionable with the tapered heel and narrowed toe) brown leather pumps worn over cotton stockings (although nylons were available), and a watch fob locket pinned to the apron. 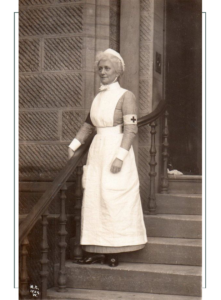 It hangs upside down, and Ellies is a reproduction which includes the nurse’s oath engraved on the back.